"Conveyor Belt" redirects here. For information about the sample course in Super Mario Maker, see Conveyor Belt Sprint. Conveyors (also known as Conveyor Belts) are platforms found in many Mario games. They are able to carry the player from one place to another without them having to move at all, and can serve as an obstacle or a means to travel faster, depending on the direction the player is heading. Conveyors in 50m in Donkey Kong. In Donkey Kong, conveyors appear in 50m. This level has a series of conveyor belts which run along the second, fourth and fifth floors. Conveyors are frequent mechanisms used by Mario and Mini toys throughout the Mario vs. Donkey Kong series. Their design in these games generally features a row of arrows running along their body, pointing in the direction the belts on the conveyors move. They are always horizontal and run either left or right. Conveyor Switches often accompany conveyors and allow the player to change the direction of all conveyors on-screen in order to solve puzzles conveniently. Conveyors are shown to be able to carry enemies, even fallen Thwomps, in their assigned direction. Conveyors in Mario vs. Donkey Kong: Mini-Land Mayhem!. Purple Conveyors in Mario vs. Donkey Kong: Mini-Land Mayhem!. In the first installment of the series, conveyors are first found in Level 1-4 of Mario Toy Company. Their color scheme depends on the world they appear in. Their main purpose is carrying Mario through tight passages while he crouches. Conveyors can also be used to ferry keys into more accessible areas near the exit. They also significantly impede Mario's walking speed if he runs against them, although he can still successfully walk in their opposite direction. This is the only game in the series where conveyors are semi-solid, meaning that they can be jumped on from underneath. 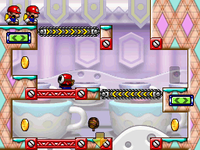 In levels with conveyors, Mario often comes across gray buttons that he can jump on and press to change their direction. Each button has two red light bulbs on its sides, alternating whenever the button is pressed to signal the change in direction. Conveyors continue to appear in Mario vs. Donkey Kong 2: March of the Minis, debuting with Room 1-7 of Mushroom Mayhem. From this game onward, they all appear as gray and are completely solid. Mini Marios that enter a conveyor are glid by the conveyor in direction it moves until reaching its end. Mini Marios turn around when they encounter a conveyor running in the opposite direction. In many levels with conveyors, there are also green oblong switches with two arrows pointing away from each other. These are positioned in the walls and the player can tap them with the stylus to change the direction of all conveyors in a level simultaneously,. Conveyor belts and switches work the same in Mario vs. Donkey Kong: Minis March Again!, where they are introduced in Room 3-2 of Magnet Mania. 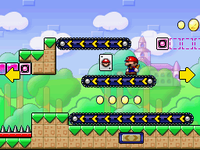 Magnet Mania also features a tutorial level that showcases the conveyor. In Mario vs. Donkey Kong: Mini-Land Mayhem!, conveyors are considerably thinner than in the previous two appearances, though they function in the same way nonetheless. They are the main focus of Teatime Twirl, which also marks the debut of Purple Conveyors. Instead of being fixed in place, the latter can be drawn between any two purple rivets using pieces acquired in a level. Conveyor Switches affect the Purple Conveyors the same as generic conveyors. After Teatime Twirl, both the fixed and the purple variants continue to appear commonly throughout the game. At page 16 in the game's instruction booklet, normal conveyors are called Gray Conveyors to distinguish them from the purple variety. It is also expressly specified in the booklet that Gray Conveyors cannot be moved. Both gray and purple conveyors reappear in Mario vs. Donkey Kong: Tipping Stars, where they are introduced in Runaway Warehouse. They are not changed from their previous appearance. Conveyor Belts reappear in Super Mario Bros. 2, Super Mario Bros. 3, Super Mario 64, New Super Mario Bros., Super Mario Galaxy, New Super Mario Bros. Wii, New Super Mario Bros. 2, and New Super Mario Bros. U. In Super Mario Bros. 2, they are only found in World 7-2, where their color is purple/red and enemies aren't affected by it, unlike later games. In Super Mario 64, it makes it's first 3D appearance with its color being yellow and having arrows showing the direction it's pointing in the direction it normally goes. In World Flower-Castle in New Super Mario Bros. 2, there are two Conveyor Belts that can change directions and colors (blue or red) by hitting a yellow switch, one of which appears in the battle against Lemmy. Conveyor Belts also appear in Super Mario 3D World. However, they only appear in the levels Bullet Bill Base and Captain Toad Gets Thwomped. Conveyor Belts can be used in Super Mario Maker and Super Mario Maker for Nintendo 3DS, where their speed can be adjusted by shaking them. Their direction and length can also be changed. Pressing a P Switch causes the Conveyors to stop moving. They also reappear in Super Mario Maker 2. Conveyors appear again in Mario & Luigi: Bowser's Inside Story, where black-colored ones are found in Bowser Path. Bowser can be seen going against a conveyor when for part of his conversation to the Shy Guys he released from the cage. Conveyor Belts also appear in Super Smash Bros. Brawl, as a Custom Stage Builder part. They are unlocked by creating at least five custom stages. Conveyor Belts are present in Yoshi's New Island in the level Hotfoot Hurdle. They are rather short and floating above lava. They run left (as signified by the three green arrows displayed on them) to make it more difficult for Yoshi to advance to the right. Conveyor Belts are usually placed in rows or one above the other. Conveyor Belts appear in World 6-6: Feel Fuzzy, Get Clingy in Yoshi's Woolly World and Poochy & Yoshi's Woolly World, where they are made of the hooks from a hook and loop fastener (colloquially known as Velcro). Because of this, Yarn Yoshi can cling onto them as they move (hence the level name), allowing him to access unreachable areas. Burrberts are often found stuck to Conveyor Belts and carried by them. ↑ Mario vs. Donkey Kong: Mini-Land Mayhem! instruction booklet. Nintendo.com. Retrieved March 13, 2018. This page was last edited on February 15, 2019, at 18:42.